OceanicTime: Girard-Perregaux Sea Hawk III PRO? 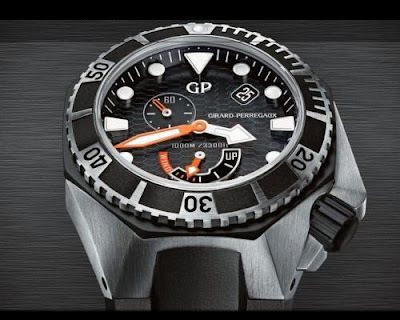 Girard-Perregaux Sea Hawk III PRO? By TLex So this is the evolution of the Sea Hawk! I knew it was coming, but wasn't prepared for anything nearly as radical as this! Girard-Perregaux will officially unveil their new Sea Hawk next month, but until then here's a leaked rendering to tide us over. The case design has a stealth bomber quality to it - not too dissimilar to the H2O Orca Mono and with perhaps a very slight hint of LW's new Okto II. There seems to be some kind of special technology going on there - could be that it's made up of multiple pieces. I hope it's Titanium. I'm not sure that I quite understand what's going on with the crown guard at this stage. The dial is interesting. It has a honeycomb effect with large 3D markers that tower high above it - very dramatic! This Sea Hawk is more like a concept watch. It's totally unexpected. Personally I like it, but I think it's going to be an acquired taste for some. GP have gone quite heavy handed on the design this time. I'm hoping there's an engineering explanation as to why. Nevertheless it's an intriguing new Sea Hawk generation that leaves me wanting to see a lot more . . . Surprisingly, I like the design as well. Don't know if I would ever get one, depends on the thickness. Looks like it might be crazy thick. The dial is amazingly well balanced given the asymmetrical layout of the PR and the date.